President Joko `Jokowi` Widodo and South Korean President Moon Jae-in signed six memoranda of understanding at the meeting in Changdeokgung, Seoul on Monday, Sept. 11. “I and the delegates are thankful that we were warmly welcomed,” said Jokowi in a written statement. The Indonesian president’s visit to Seoul, South Korea, marks the 45th year of diplomatic relations between both countries. The six points contained in the memorandums of understanding comprise the cooperation in the field of immigrations, economy, and human resources management. The MoU will also see the partnership between the Indonesian republic cabinet secretariat and South Korea’s Ministry of Government Legislation. It also oversees cooperation in the field of maritime security and shared activities related to the ‘Industry 4.0’. 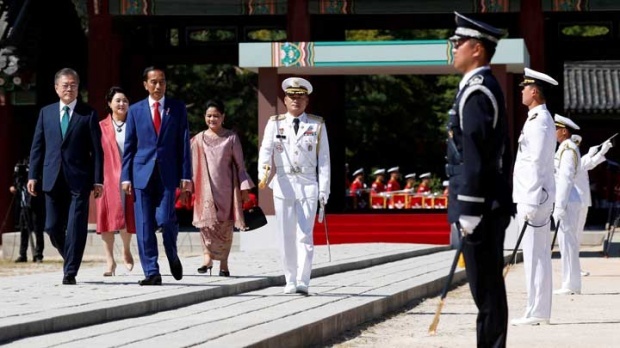 In his visit to South Korea, President Jokowi was accompanied by several state-ministers, among others were the Coordinating Minister of Political, Law, and Security Affairs Wiranto, Foreign Affairs Minister Retno Marsudi, and Cabinet Secretary Pramono Anung.